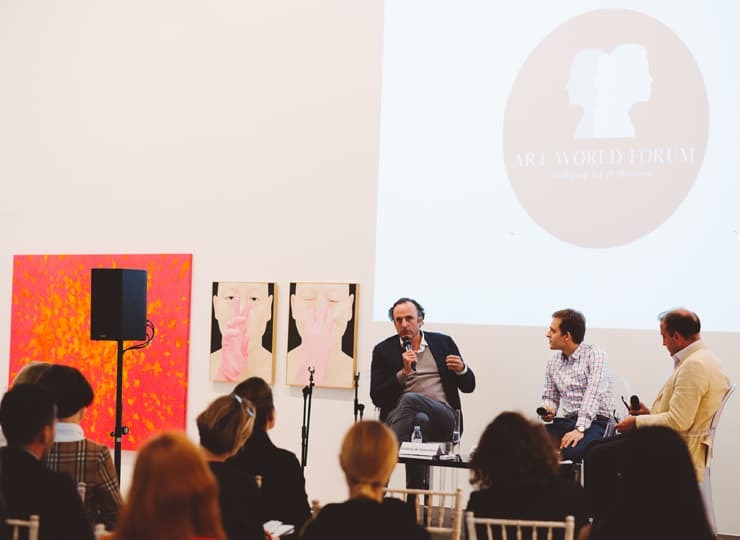 On Thursday 13 September, the Art World Forum conference took place at the Saatchi Gallery as part of START Art Fair. Formulated through a series of panel discussions, the overarching theme of the day was the influence of new trends and technologies that are currently sweeping the art world. Art World Forum is Asia’s only independent art business conference organiser and has hosted events in Singapore, Hong Kong, Berlin and Florence. 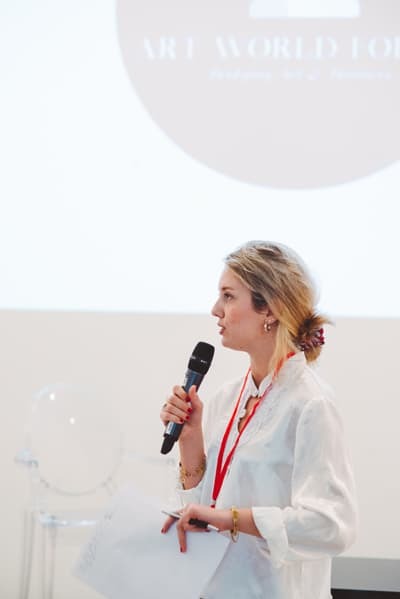 Founded by Anni Oates and Veronica Neo, Art World Forum is a global platform with the mission to bring together art professionals and business leaders to provide marketing and networking opportunities to everyone in the art world community. Emergence & Confluence, their first event in London, aimed to unravel the market’s rapidly changing cultural landscape. Frédéric de Senarclens, the Founder of ArtMarketGuru, was invited to speak on the panel discussion ‘A Collector’s Market: When Technology Joins The Party’ alongside Jakub Krcmar, Co-Founder of Veracity Protocol and moderated by the Founder of Arts Research, James Goodwin. The discussion centred around how dealers and collectors are reacting to new technologies and whether tech-led start-ups strategies and technologies are influencing the art market. What is the extent of the influence of these new technologies on the art market? What are the current technology trends and their limitations? Recent changes in the art world show that technology is most definitely having an impact, although there are still big players who are resisting it. Blockchain, the buzzword of the moment, artificial intelligence, virtual reality and augmented reality have all gained major public interest, however, there is a lot of disconnection between the tech companies and their audiences. Most tech companies who engage in disrupting the art world are led by entrepreneurs with no or very little experience in the art market. The question still stands whether dealers, collectors and other major players in the art world are in fact ready to accept and use these technologies. Frédéric de Senarclens commented that there are many tech start-ups operating at the moment and like with everything, there will be a time when one or two key players will come out on top and will become the major institutions go-to companies. Another interesting notion that was discussed was whether there will perhaps come a day when artificial intelligence will be able to determine how people are attracted to a work of art. Going beyond our own intuitions, can technology determine tastes as well as taking on other considerations such as interior design, taxes and investment? Could this technology then take the place of the art advisor? Some would argue human interaction will never be replaced by technology whilst others may take the stance that it would be cost effective, efficient and reliable. Another interesting point was touched on in the final panel discussion ‘A New Breed of Art Fairs and a New Generation of Collectors’, cost is a huge factor of art fairs with galleries paying huge amounts of money to rent spaces and although smaller emerging galleries are often given a small discount it is still a constant struggle. Deborah Harris, Gallery Consultant and Former Deputy Director of the Armory Show suggested a possible solution could be to extend art fairs beyond a week, so that galleries are able to build a stronger presence. Earlier Senarclens, as a former gallerist, questioned whether virtual reality and augmented reality might not offer interesting solutions for art fair organisers and gallery participants to engage with a much larger audience, lower costs and tackle other inconveniences such as shipment and travel. Adriano Picinati di Torcello, Director of Art & Finance at Deloitte educated the audience on Finance and Art and the inherent ties both sectors have. A central drive to the art market is wealth, with over 32 million ultra- and high net worth individuals, and the amount of super rich individuals constantly growing. In turn this is bolstering the art market which heavily relies on regulation, new technologies and wealth. Keeping up with the latest trends and technologies is key for the art market in order for it to keep progressing. Niio, a tool used to manage and access your digital art collection from anywhere can be used as an example. CEO and Co-Founder Rob Anders discussed how Niio is an effective solution which has reduced the complex process of getting a digital artwork to its final destination – a gallery or exhibition. Like many other art tech start-ups Niio’s vision is to bring together artists and galleries in a purpose-built ecosystem which is simple and effective. Overall the day was a valuable insight into the future of the art market from the perspective of top industry leaders.